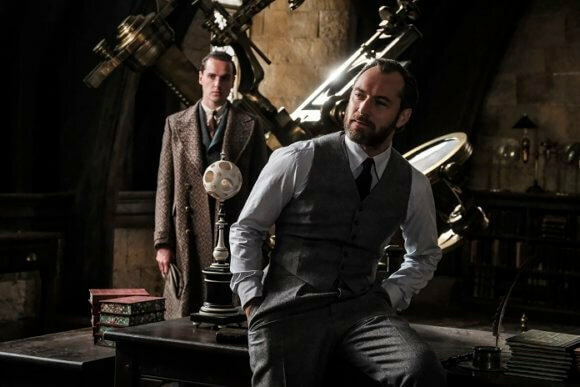 Warner Bros Pictures’ latest video from Fantastic Beasts: The Crimes of Grindelwald connects the dots to the world of Harry Potter. The film’s stars – Eddie Redmayne and Jude Law – introduce the new video which features clips from the Harry Potter franchise as well as new scenes from this second movie of the Fantastic Beasts series. The film features an ensemble cast led by Eddie Redmayne as Newt Scamander, Katherine Waterston as Tina Goldstein, and Dan Fogler as Jacob Kowalski. The cast also includes Alison Sudol as Queenie Goldstein, Ezra Miller as Credence Barebone, Zoë Kravitz as Leta Lestrange, Callum Turner as Theseus Scamander, Claudia Kim as Nagini, Kevin Guthrie as Abernathy, Carmen Ejogo as Seraphina Picquery, Poppy Corby-Tuech as Vinda Rosier, Jude Law as Albus Dumbledore, and Johnny Depp as Gellert Grindelwald. Harry Potter‘s David Yates directed from a screenplay by J.K. Rowling. David Heyman, J.K. Rowling, Steve Kloves, and Lionel Wigram produced the second film of the franchise. Tim Lewis, Neil Blair, Rick Senat, and Danny Cohen served as executive producers. Fantastic Beasts: The Crimes of Grindelwald will open in theaters in 2D, 3D, and IMAX on November 16, 2018. The MPAA’s rated the fantasy adventure film PG-13 for some sequences of fantasy action.